Although I took the minibus between Slovakia and Switzerland already several times during my Part I internship in Zürich, my recent journey was quite special. Nowadays it’s quite a good business to transport people between Slovakia and their place of work abroad. The company I travelled with transports people to Austria, Germany and Switzerland- 3 countries the most popular amongst Slovak population. The company offers 2 buses a day, each transporting 8 people. It’s difficult to say the exact number of similar companies, there could be 20, maybe even more. During this 16 hours long trip, I had a chance to listen to several life stories of my travelling companions. Some passengers were experienced and older, some of them just finished secondary school. Let me tell you about 2 of them, especially significant and relevant for my work. 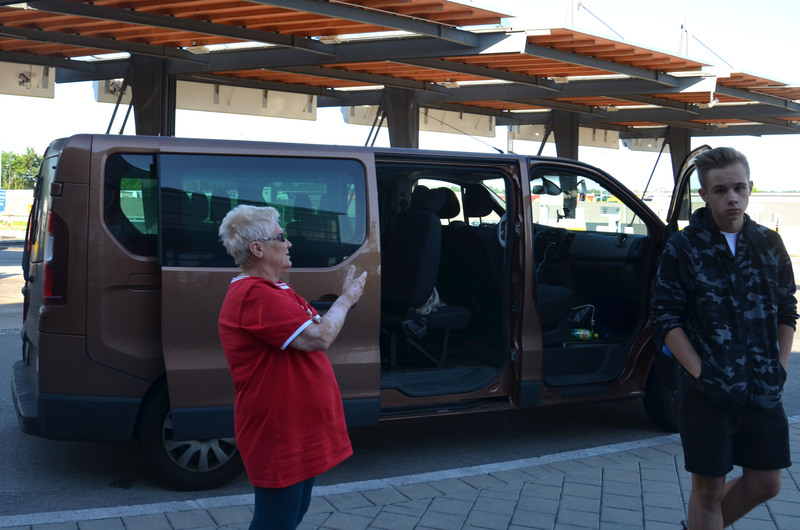 A very energetic lady in her 70s was traveling to Switzerland to celebrate the 1st birthday of her grand-granddaughter. This lady is living alone in Slovakia, in a south-central part, which she called ‘a hunger valley’. She spent her whole life working in Utekáč, a local glass factory employing 500 people. Like in the case of all industries in that area (chemical plant, brick factory, few other glass factories, and many many more…) the production stopped a short time after the fall of communism, when the factory was privatized. She said the only people employed in the area are the ones working abroad. Small children are often left home with grandparents or old neighbours. There are almost no secondary schools. She remembers the time when she attended local economy school and even the factory itself provided some extra educational courses. Her whole family is working abroad, on a small Swiss farm and food company, where they work sometimes 12 hours a day and during the weekends. She felt proud while telling me about ‘the old good times’, when she was employed and when the glass made in local factory was exported into the whole world. She even invited me to come to their ‘hunger valley’, and promised to show me all ruined industries. Another man is also working on a farm. We laughed a lot about how bio is ‘bio’. He comes from the most Eastern part of Slovakia, and shared some Ukrainian sweets with me (together with alcohol, they are cheaper than is Slovakia). As a result of a very high unemployment crisis, he had to leave his wife and 2 children 8 years ago, and since then has been working already in 5 different countries. He does not get a lot of holiday and can see his family only 2-3 times a year. His older son is working as a lorry driver for a German company. Although the journey seemed never-ending, it was full of great and funny discussions, complaining about things not functioning in Slovakia and being clever about how it could be solved. The return journey to Slovakia had a very similar character and I got to know 8 other people looking forward seeing their families back home.